The Primary class offers both a Half Day Program and a Full Day Program. The Half Day Program is offered for younger children as they transition into a classroom environment. Although entrance into the primary class is based on readiness, most children usually are ready between 2 ½ and 3 years of age. Therefore, children spend 3 to 4 years in the primary class, inclusive of the “kindergarten year.” The first year is an introduction to the new environment and social acclimation. A secure foundation of self-discipline, independent functioning, and self-confidence is formed. The second year is a consolidation of skills and knowledge and a growth in competence and self-assurance. The last years are ones of unfolding and mastery. This is the time you see the traditional types of learning, such as reading, writing, and math computations come to fruition. These skills are actually a by-product of the more important foundational characteristics, such as independence, self-motivation, and concentration that the child has internalized and will posses throughout his lifetime. The Primary curriculum can be defined by six distinct areas of knowledge as listed below. Practical Life – Activities concerning care of oneself, the environment, and others are cultivated. These exercises lay the groundwork for independence, help develop concentration, and further refine their coordination. Many of these tasks, like sweeping or buttoning, can be seen performed by adults during the child’ daily routine. Purposeful activities, with tools of the right size for small hands, allows the child to satisfactorily repeat a task until mastered. Sensorial – Making sense of all impressions received through the five senses is the goal of this area. Exercises are designed to begin putting order in the world around them through sorting, categorization, naming, and then application of concepts. Abstract mathematical qualities are introduced through the use of concrete materials. Language – Learning in this area begins from the moment the child enters the class and does not end until they graduate at age 6 years old. Activities are first designed to expand a child’s receptive and expressive language, as well as, to further their exposure to a variety of linguistic opportunities. The experience of watching older children engaged in writing and reading activities intrigues the younger child and entices them to join in these lessons, too. This makes learning to read and write a natural process of acquisition. Grammar, spelling, and sentence analysis work further develops the older child’s understanding of the written word. Math – The foundation for math actually begins in the areas of Practical Life and Sensorial. To this base of knowledge is added counting, number relationships, the four operations, fractions, geometry, even algebraic concepts. Through manipulative materials, the child experiences concepts in isolation, which prepares them for abstract reasoning and problem –solving. Cultural Studies – Geography, the sciences, art, and music are all integrated seamlessly throughout the curriculum. 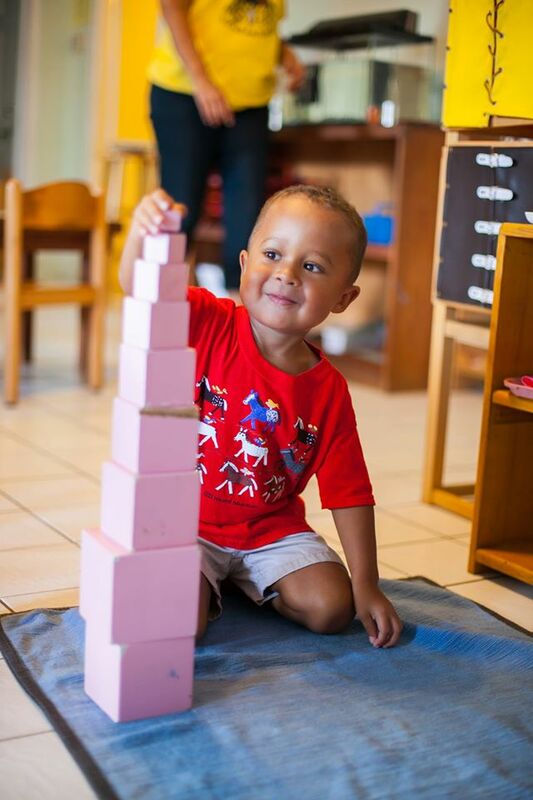 As the child’s understanding of the world begins to turn outward, activities are designed to help connect them with our global community. Lessons about the natural world allow children to embrace our role as caretakers. While, art and music activities give the child an opportunity to see, hear, and create beauty for himself. These experiences are greatly enhanced by our community sharing a variety of diverse cultures and interests with their classmates. Grace and Courtesy – These lessons are designed to help the child feel comfortable with others and refine their social graces. By providing the right words and time to practice, manners and personal skills are taught as any other lessons would be presented. Daily exposure to these activities promotes social and emotional intelligence in even the youngest child. The Primary Day: Class will begin with morning stretching activities and/or yoga followed by individual work introduced by the Guide. Snack will be offered during the morning session. The morning “3-Hour Work Period” is vital to the success of Montessori education. It means that children have three hours to choose and carry out their own work. It does NOT include any required outside play, group story time “circle time,” music, or any other activities which take time away from the child’s own choice of activity. During this time adults and children alike respect a child’s concentration and do not interrupt one who is busy at a task. All of the traditional group activities spontaneously arise according to the interest of the child or a group of children during the day, or are occasionally called by the teacher if necessary. At the end of the 3-hour work period, the children will prepare, eat and clean up their lunch. Children who require a nap or rest will do so following lunch and outside free play. Half day students depart at 12:30PM. The afternoon “2-Hour Work Period” is also vital to the success of Montessori education. The older students need that time to continue academic education. The children will have two hours to choose and carry out their own work. During this time, they will have the opportunity to continue working on previous tasks or begin with new lessons should they so desire.